No Crafturday post today. 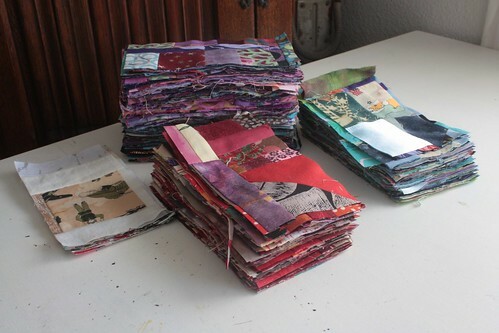 I’ve been in Art Quilt mode but don’t have anything ready to show and haven’t had time for any crafty diversions. BUT… the current issue of Quilting Arts (Feb/March 2012) magazine arrived in my mailbox yesterday and it includes a lovely Q&A with all of us members of Twelve by Twelve! This project has been sitting on my sewing table for probably two years, and for no good reason either! It’s the Julie Tasche and it called to me as a sister to my beloved Multi Tasker Tote. I had some fabric on hand that I didn’t know what I wanted to do with when I bought it, but looked perfect for the Julie. My first stumbling block though was the elastic and stopper thingies for the pockets. I found a source for the elastic cord, but I would have to buy it by the bajillion foot spool. The local retailer only carried black and white, and was out of white. I waited several months for it to come in. While waiting, I searched for stoppers and came up, again, with boring black or white. At least those were in stock, so I settled and bought white. I wasn’t sure about the base of the bag, so I mulled over some pink leather I had and mulled having the base continue up the sides and inch. The mulling lasted a few months. Meanwhile, I went to Quilt Hawaii and learned about Texture Magic in my Threadology class. So, I came back and Texture Magic-ed two pockets. Then I started assembling the parts. But, I didn’t like all the different fabrics for the pockets and I didn’t like the orientation of the handles, so I set the project aside until I could take them off and rearrange. Being a low-priority project, that added more moths. Luckily, I did some traveling off-island and not only found while elastic cord, but many colored stopper thingies. I stocked up (thank you Mood)! But I was still too busy with other projects to get back to the Julie Tasche. Finally, a few weeks ago, I decided I just needed to finish the bag. It’s not like it was hard to sew or anything, and at least now I had all the supplies. The pink leather base looked wrong, so I switched to denim from an old pair of jeans. I opted not to alter the pattern, and hey, it looks great. I left my contrasty Texture Magic pockets as-is but flopped the striped center pockets so the stripes became the lining (ah, much better!). I changed the straps so that instead of each one starting on one side of the bag and ending on the other, each strap stays on it’s own side of the bag. This makes it hang “right” for me when I put the straps over my shoulder. I love the turquoise stopper thingies on the elastic cord. Now, I just need an outfit to coordinate with my bag so I can start wearing it. It’s customary in Hawai’i to give lei on special occasions. The event could be a birthday, a graduation, congratulations on a job well done, or a welcome to the islands. 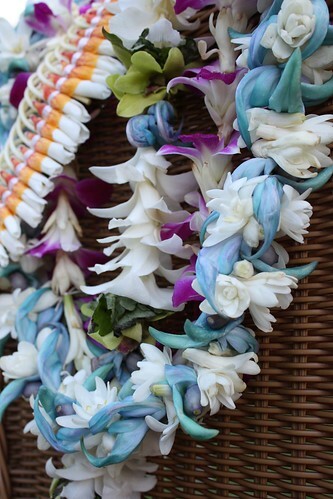 Normally, lei are flowers, but sometimes they are made of shells, candy, origami lucky stars, or paper blossoms. My sister and her family arrive today, and while she and my BIL will be bedecked in flowers and kukui nuts, I figured she wouldn’t appreciate candy for her young kids, and conversely, the kids wouldn’t appreciate the fresh flowers. So I got crafting. I’m definitely NOT the first to make this kind of lei. Elementary school teachers have been helping kids churn these out by the dozens every May for Lei Day. They make theirs from construction paper, but I used double sided scrapbooking paper for a fancier look. I really wanted aloha prints, but my stupid craft store which used to have them no longer carries such regional stuff, and I wasn’t willing to drive all over the island looking for hibiscus patterned paper. But, I digress. I used two punches to cut out about 40 flowers from three different papers. After punching out the flowers, cut about 6 regular drinking straws into 3/4 inch bits. Cut a piece of string about 60″ long and thread it onto a large needle. Tie a knot about 6 inches from the end of the string. Poke the needle through the center of a flower to thread it onto the string. Add a straw section, then another flower, then a straw section, and so on until you’ve used up all the flowers. Tie another knot after the last flower. Put a straw bit on both tail ends of the string (as spacers) and tie the ends together with a square knot. If desired you can cover this plain knot with a little bow or puff of curly ribbon. Plastic pony beads instead of straw sections looks really nice too, but remember to punch out about twice as many flowers. Place lei over the head of a deserving kid and give them a big hug and kiss. Aloha! The next two themes for work I want to, or have been invited to, do are metamorphosis and rituals. Immediately these words brought to mind the works of Joseph Campbell and I set about re-reading “The Hero With a Thousand Faces.” Reacquainting myself with the book didn’t significantly change what I already had in mind for the projects, but it did get me thinking about books which have stayed with me over the years. I’ve always been a voracious reader, even when family life and the diminished brain cells of motherhood have kept me from actually reading, I still love the idea of being able to read. This, combined with so many end of the year/new year lists in blogland, inspired me to make a list, in alphabetical order so as not to give any special preference, of books which, over the decades, I have enjoyed and which have shaped me in one way or another. Make what you will of my taste in books. I see something of a pattern in my choices, but I think it alludes to more than is actually there. What books have informed you? Our beloved exchange student leaves today. She’ll be returning to Germany well equipped for the new school year though. In addition to well honed English skills and a suitcase full of American clothes, I’ve sent her off with a Multi-Tasker Tote bag much like mine which she’s been coveting. 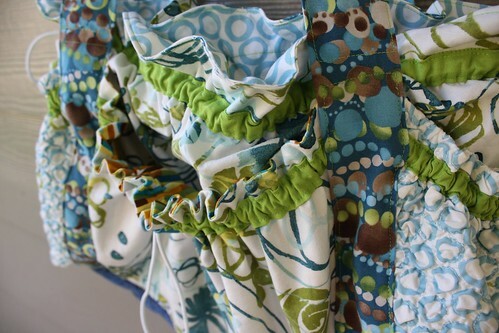 This side has a big velcro-topped pocket in addition to the floral lined ones that are part of the original pattern. I love this side in which I kept the integrity of the uniform blouse front. On my tote the button front is purely decorative. 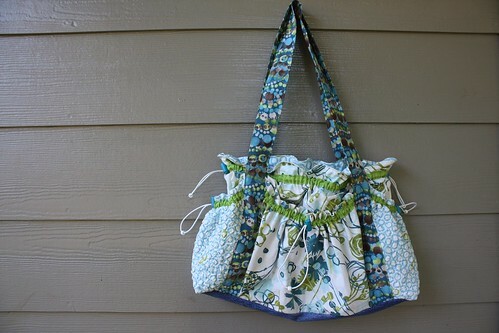 On this tote, I lined it so that the zipper can open to an actual pocket! 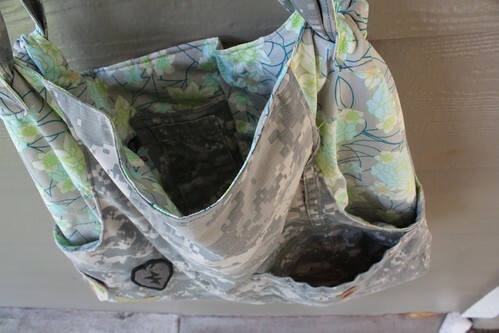 There are so many pockets on this tote it’s crazy! My hubby’s favorite is the pen pocket that normally lives on the uniform sleeve. I moved it to the tote interior along with a patch pocket and a flap pocket from the blouse front. And there’s a little loop to clip things on to too. And, here’s the bag in situ as a fabulous beach tote.